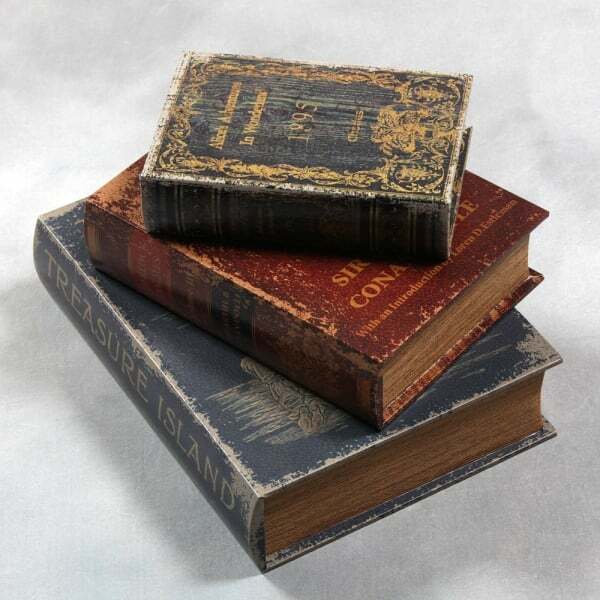 These original and distinctive Storage Boxes are disguised as antique books, with classic titles comprising Treasure Island, Sherlock Holmes & Alice In Wonderland. The vintage style set of boxes is as practical as it is decorative; the three different sized boxes nest inside each other to save space when not in use. They will make a fantastic addition to many homes and are a great gift idea for book lovers. Free UK Delivery on Orders Over £50 applies to Mon-Fri mainland delivery only. Orders over £50.00 qualify for free delivery if under 2kg and are sent by Royal Mail. Orders over 2kg or under 2kg, but you require to be delivered by courier, will be sent at cost which will be advised during checkout. Orders over £150.00 will be sent for free. UK Orders placed by 2pm Mon - Fri will be dispatched the same day. Orders placed after 2pm will be dispatched the next working day. Orders placed after 2pm Fri will be dispatched the following Monday (unless a bank holiday). Orders that you required to be delivered by 12pm the next working day must be placed by 2pm Mon - Thur and next day courier delivery by 12pm chosen. Saturday and Sunday delivery by DPD is available to any UK mainland address for orders placed by 2pm Friday at a cost of £9.00 for orders under £50.00. Orders over £50 with free delivery are subject to a small surcharge. If you require delivery on either of these days, please select Saturday or Sunday Courier Delivery during checkout. Regrettably, this service is not available for the Highlands, Islands, Channel Islands or Northern Ireland. Please note we do not work bank holidays. Orders placed on a bank holiday, or after 2pm on a working day before a bank holiday, will be dispatched the next working day Mon-Fri.
We use a weighted delivery system to calculate delivery charges and ensure you pay a fair price, with all deliveries being charged at cost. The cost of UK mainland delivery and if delivery is free is shown on each product page. The total delivery cost of more than 1 item and if delivery is free is shown at the checkout stage. You only pay once for delivery and where possible purchases are combined to minimise the delivery cost. We usually dispatch orders on the next working day and where possible on the same day, if ordered before 2pm. Orders where delivery is via courier will be booked in the same day if made before 2pm or the next working day if after 2pm and will be dispatched the next working day after that. Purchases made during the weekend will be processed on Monday morning. On rare occasions an item may not be available and should this occur, we will contact you immediately and issue a refund. Great care is taken in packing all purchases. All goods are sent in a protective outer and cushioned with air packing, bubble wrap, foam chippings and other materials. Where possible we recycle packaging from our suppliers and local businesses to minimise our impact on the environment and to allow us to charge postage at cost. This is mixed with new packaging we have purchased which we strive to ensure is environmentally friendly. Your purchase will arrive well packed and protected but may be in a previously used box. The majority of parcels will require a signature on delivery. If no one is likely to be available to sign for them it may be an idea to have your purchase sent to a works or neighbours address or local store but please note once delivered to the address requested and signed for where required, responsibility for the parcel passes to you. Please note we may ask for extra proof of identity or your address. This is to safeguard you and us against online fraud. Our card processing providers perform rigorous security checks and may sometimes require additional confirmation of identity and address. Most orders will arrive within the stated time but delivery times may occasionally take longer especially at peak times such as Christmas and allowance should be made for this. We cannot be held responsible for delays caused by Royal Mail or our couriers but will assist where possible. We use Royal Mail and DPD for delivery within the UK. Orders under £50.00 cost from £2.00 to £6.00 for UK mainland delivery, depending on weight and the delivery option chosen. Orders are usually delivered within 2-3 working days of dispatch, unless 1-2 day courier delivery has been chosen. A guaranteed next working day delivery is also available in most cases. UK mainland delivery is free for orders over £50 with delivery within 1-3 days of dispatch. We use Royal Mail and couriers for European orders with delivery taking 3-5 days to Western Europe and 5-7 days to Eastern Europe. All goods are sent fully insured and require a signature on delivery. Delivery to most European countries is available and can be selected during checkout. The cost for your chosen country will then be shown. Should the country you require delivery to not be shown, please email or telephone us on +44 (0)1603 559250 for a delivery price. Royal Mail and couriers are used for international orders with delivery usually taking 4-14 days depending on location. All goods are sent fully insured and require a signature on delivery. Delivery to your chosen country can be selected during checkout and the relevant shipping price for the products in your basket will then be displayed based on their weight and size. If the country you require delivery to is not shown please email or telephone us on +44 (0)1603 559250 for an accurate shipping quote. Purchases for customers outside the EU are tax free. Please note however that you are responsible for any duties which may be payable upon the arrival of your goods in your country. Payments from overseas customers will be processed in GBP Sterling and the receipt will also show GBP Sterling prices. Your card issuer will charge you the Currency Exchange Rate in use that day and this will be shown on your statement. Any refunds made will also be in GBP Sterling using the Currency Exchange Rate in use that day meaning that your refund may differ slightly from the original payment. We accept no responsibility or liability for this. Regrettably there are some items we currently are unable to ship internationally due to the likelihood of them being damaged in transit or because they are not suitable for use in some countries. Should this be the case, we will notify you and issue a refund. We reserve the right to make an additional charge for particularly bulky or heavy parcels that result in an additional delivery cost. Please note it is your responsibility to ensure you enter your address correctly and completely during checkout. Regrettably we are unable to check addresses to ensure they are as they should be and we are not liable for any inconvenience or disappointment caused by delays in delivery or due to items being returned to us because they cannot be delivered. If goods are returned to us due to an incorrect/incomplete address or have not being collected from a local Post Office or courier depot, the customer will be liable for the cost of sending them again. If this is not acceptable, the order will be cancelled. On rare occasions goods may be lost in transit. Should this happen we will replace them providing a replacement is in stock. A refund will be given if no replacement is available or the goods are no longer required. For a delivery to be classed as lost a reasonable amount of time must have passed. For goods sent by Royal Mail this is 16 days. Consequently we cannot replace or refund an item until 16 days have passed since posting. We will of course attempt to trace and resolve any delayed deliveries in the meanwhile. Royal Mail and the couriers we use take goods lost in transit seriously. If an item is lost, there will be an investigation with the recipient usually being contacted as part of this. If the loss is regarded as suspicious, it is possible the police may be involved. Goods received should be checked for damage, defects and shortages as soon as received and any problems notified to us within 7 days. Our acceptance that goods were damaged on delivery, are defective or were not delivered. Confirmation of any damage or defect being provided. We will ask for either photographic confirmation via email or for the item to be returned so it can be examined. The packaging the items were delivered in and invoice supplied with the order being retained when claiming for missing items. You not having attempted to repair or correct any damage or defect. By doing so, you will be deemed to have accepted the goods in the condition they were received and give up any right to reject or return them. We will not replace or refund goods where we believe any damage has occurred after delivery or if any defect appears to have been caused by misuse, improper handling or incorrect assembly. We will cover the cost of returning items we agree were delivered damaged or are defective by sending a pre-paid returns label, arranging collection or refunding reasonable return postage costs, up to a maximum of £10. Return postage costs over £10 must be agreed to by ourselves prior to sending. Should an item be defective but has also suffered damage believed to have happened after delivery, it will only be eligble for replacement or a full refund if the defect means the product is non operational / not fit for purpose. Defects such as cosmetic blemishes do not count, but will be eligible for a part refund. If for any reason you wish to return part or all of your order, please log into your account (if you have created a full account with a password) and submit a return request or simply return the item(s) with a copy of your invoice and note about why they are being returned. You notify us of your reason for doing so. Your goods are returned in their original condition, in the original packaging and include any accompanying accessories and labels or tags. The goods, any accessories, labels or tags and the packaging have not been damaged unless already notified to us and their return accepted. Where products are in sealed packaging this must not have been broken/opened. They have not been used, assembled or part assembled unless found to be defective and their return authorised. The product has not been made to order or made to your specification. These can only be returned if damaged on delivery or defective. They are the actual goods we sent. It is not a gift voucher. These cannot be returned. We are under no obligation to accept returns and provide refunds for goods that do not meet these terms. Orders placed from the 1 November - 24 December are subject to an extended return period and can be returned up until 24 January. Any goods being returned should be adequately packed to protect them in either the original delivery packaging or a suitable alternative. We advise a service offering signed for delivery is used and that it includes adequate insurance. For smaller items we recommend Royal Mail and for larger or heavier items we suggest a courier booked through Parcel2Go. Goods being returned are your responsibility until signed for by us. If damaged or lost while being returned we are not liable unless we have arranged for the goods to be collected via our courier. Please note we will only accept liability for damage to goods we have arranged to be collected if they have been packed in the original packaging they were delivered in or packaging that offers equal protection in transit. We will provide a full refund, excluding any original delivery charge*, via the payment method used as soon as possible after goods are returned, providing they meet our Returns and Damaged or Defective Goods terms. *If you have notified us in writing within 14 days of receiving your goods of your intention to return them and they meet our Returns and Damaged or Defective Goods terms, we will also refund any original delivery charge. If we have accepted that a product was damaged on delivery or is defective, we will also refund any original delivery charge. Unless damaged or defective, goods returned for any other reason, such as a change of mind, will be at the buyer’s expense. We will retain the returned product until you arrange for it to be returned to you. If its return is is not arranged within 28 days, we will destroy or dispose of the returned goods without any liability to you. In some circumstances, such as goods being returned with damage or damaged packaging that we have not been nofified about, we may be able to offer a partial refund which takes into account the damage / condition. If this is not acceptable you are then responsible for arranging for the goods to be returned to you. Any fraudulent or dishonest returns such as different goods or returns with items missing from what we sent may be reported to the police. Payment can be made online by any major credit or debit card, through PayPal or with Hurn & Hurn gift vouchers. Our credit and debit card processing is carried out by Sage Pay, the UK’s largest Payment Services Provider, who use the latest technology to provide a secure payment facility. PayPal allows anyone to pay securely in the way they prefer, including through credit cards, bank accounts, buyer credit or account balances, without sharing financial information. We use the latest 128 bit SSL security which complies with and exceeds all necessary security requirements to protect your details. We do not store any sensitive information (card number, etc).